Pinot Noir is one of the chief varieties of wine grapes. In fact, it is the 10th most planted grape in the world. Its taste, as well as deep red to burgundy shade, has gained a gigantic following among wine enthusiasts. Oregon has vineyards produces among the most sought-after pinot noir. In the same fields, however, are farms of cannabis too. Among it is Oregon Pinot Noir which has a grape-flavored smoke that reminds users of the luscious wine. Its strong terpene profile also hints at its potent THC levels of up to 28%. Apart from delivering a wonderful recreational high, the versatile strain helps ease problems that patients go through while dealing with health issues. Moreover, in spite of its powerful buzz, beginners are still welcome to enjoy its psychedelic effects with the help of seasoned friends. To create such a powerhouse, its breeders took the tropical Hawaiian Purple Kush and crossed it with Pitbull. Although both are Indica-dominant strains, the two produced a Sativa leaning bud with uplifting cerebral effects. Its physical effects shine through during the comedown though, as it plants a heaviness in the limbs that eventually leaves users feeling drowsy. Oregon Pinot Noir, like other Sativa-dominant strains, delivers a quick-acting high. Just minutes after the first two to three puffs, it uplifts the mind with a rush of euphoria. Apart from enhancing the mood, the sense of happiness also clears negative thoughts. Soon after the initial effects settle, the urge to eat becomes apparent. For this reason, it is best to prepare some snacks ahead of time. A simple snack like a bag of chips should suffice. Although, having more will gratify the ravenous appetite. After about a few hours, the same rush of euphoria trickles down from the temples. As it surges through the muscles, it reinvigorates the body with a buzz of energy. If anything, one feels like a well-oiled machine as Oregon Pinot Noir relaxes any tension or tightness that prevents one from moving around. Eventually, however, it plants a soothing sensation that delivers full-blown relaxation. The smell of mulled grapes emanates from Oregon Pinot Noir’s buds. There is a note of skunk among the fruity berry overtone that fills the room once the buds are crushed. Upon combustion, it emits a sweet fragrance that turns spicy later on. In the palate, the fruit-flavored smoke bursts with the sweetness of ripe grapes and berries. Accentuating it is a subtle spiciness that leaves an immense saccharine aftertaste in the mouth. In high doses, Oregon Pinot Noir can startle users with a subtle dizziness that lasts for quite some time. This is especially true when toking the bud much too fast. Thankfully, such a side effect is rare when one starts with a low dosage. A more unavoidable reaction to smoking marijuana is a cottonmouth and dry eyes. Drinking a few glasses of water throughout the day, however, will relieve any discomfort. The value of Oregon Pinot Noir as a medicinal herb is immense. Consuming it can mitigate a handful of health issues such as stress which can exacerbate hypertension and lead to the early onset of depression. In inducing its calming euphoria, the Sativa-dominant herb also temporarily relieves symptoms of mental health issues like PTSD and anxiety albeit temporary. For long-term treatment, however, it is best to seek a medical professional. The same psychoactive compound also has a stimulating effect on the appetite. First, however, it calms any cramp or painful contractions that interfere with ability to down food. And, with its anti-emetic properties, it prevents users from vomiting. For this reason, it is a great companion to cancer patients experiencing the nauseating effects of chemotherapy. In high levels, THC also turns into a natural analgesic. Hence, it is able to relieve pain ranging from headaches to cramps. Eventually, it plants a heaviness in the limbs that tucks users to bed. Apart from hastening drowsiness, Oregon Pinot Noir also improves the quality and quantity of sleep. Any garden would look great with Oregon Pinot Noir. 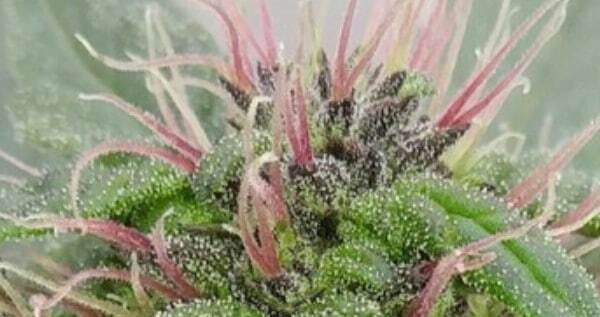 The plant is very attractive and, when fully matured, it showers the growing area with green and purple hues that sparkle with a rich layer of milky trichomes. One thing to note though is that the plant can look quite imposing when it is untamed. After all, it can reach a height of up to 15 feet. If grown outdoors, growers have the option of letting the plant grow tall. However, applying the Screen of Green method will not only keep it short but also create more colas for buds to sprout. For indoor growers, topping the plant early is a necessity. Shortening the vegetative stage will manage the plant’s height while simultaneously forcing it to flower early. From then on, growers may improve trichome production through super cropping as well as exposing it to a 12/12 light cycle. Oregon Pinot Noir has a short flowering period compared to other Sativa-dominant strains. Normally, it takes 7 to 9 weeks but some growers can harvest as early as 6 weeks. Once ready for harvest, it produces 12 to 16 ounces of buds per square meter. In the northern hemisphere, Oregon Pinot Noir flowers from the last week of September to the middle of October. It yields at least 16 ounces of dried buds per plant. Have you ever smoked or grown your own Oregon Pinot Noir? Please let me know what you think about this marijuana strain in the comments below.